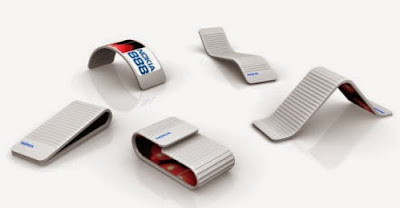 Nokia showed off a prototype for a smartphone case that could be twisted and flexed by the user last month at its Nokia World press event last month in London. Now a new video has popped up on YouTube that greatly expands on that kind of a smartphone concept. The video calls it HumanForm, and it shows some features that we haven't even seen in the best science fiction movies. Nokia says the smartphone concept in the video is supposed to be "where technology is invisible and intuition takes over." Ok. That sounds interesting but we are not really sure if the concept developed in in the video is all that intuitive. After all not too many phones are designed specifically to bend and twist around. How intuitive can that be to use? Anyway, the video does show some rather cool features such as making the entire phone one big screen. The video shows applications being brought up and used simply by shaking the phone, kind of like shaking a snow globe to see the flakes go up and then go down. The video also points out features such as being able to "feel" a picture on the screen. We are not sure how that works, or even if we want to "feel" a picture in the first place but hey, maybe Nokia thinks that sort of thing will be hip in the near future. One thing that could be done in smartphones right now is having someone call you but also have the image of said person project the kind of call he or she would make. If you see a happy picture calling you, that's good news. If you see a sad or angry picture with your incoming phone call, well ... maybe you should let that go to voice mail. The entire video is worth watching, if only to see how Nokia sees the future of smartphones. We don't think a lot of these concepts will actually work in the real world but we will be happy to be proven wrong in the years to come.